You can expect a few smaller “slice of life” updates here over the next week or so. I’m going to be out of town on vacation and I don’t want things completely barren while I’m gone, but I also have to pack and run a million errands before we leave (this compounded by the jerk who threw a rock through our front window last Saturday, but don’t get me started about that). Anyway, I had my first raid with Business Time last night as a holy paladin. We went to Throne of the Four Winds to do heroic Conclave of Wind again since some people had missed it when we got the kill a bit earlier this week. I was a mage for our first kill, but I’d never healed it before! It went well. We were able to repeat the kill. I screwed up some times, other people screwed up some times. I had to learn the rhythms of tank damage. I started out on the Nezir platform healing our bear tank and then transitioning to Anshal, but at some point we made a healing switch and I swapped to healing Voss. This is a screenshot that doesn't actually include Vid at all, but it's still thematic! Really, truly. The cooperative aspect of this role appeals to me so much. I had an absolute blast. I did not play perfectly (far from it) and I will need to make some adjustments to my UI with reminders to use CDs and auras so I can track my own buffs. But still. Holy heck, you guys, I healed heroic Conclave of Wind! I don’t usually post any bragging type things, so it’s not that, it’s really just – I was happy with my performance generally although I know many areas I can improve. Conclave of Wind is really a great acid test because it’s three individual groups each ‘on their own.’ There is no secondary healer to back me up; if my tank dies, it’s on me. Particularly at the end things started falling apart a little bit, but we pulled it off. 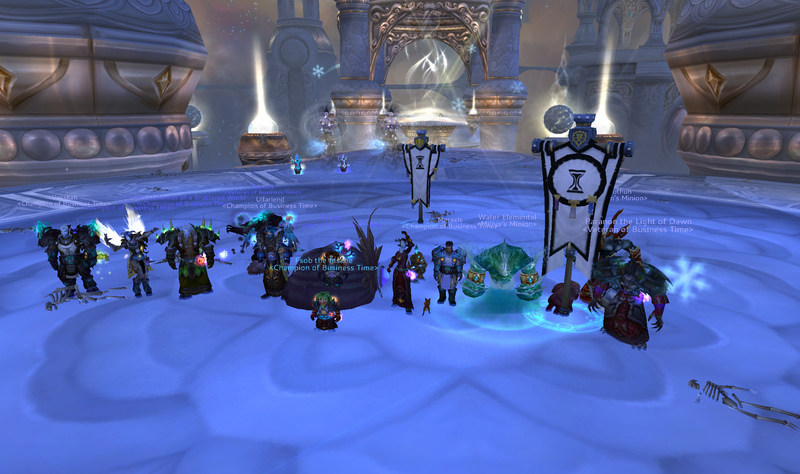 After this, we didn’t have much time in the raid so we went and killed Cho’gall (normal) and ODS (also normal). I honestly thought that just because we now have two holy paladins, those bracers would drop, but clearly this is a logical fallacy. (I was not, incidentally, intending to claim them for myself or roll on them in any way). That means Sin, our other holy paladin, killed Cho’gall 15 times throughout this tier of content without ever once seeing the bracers drop. Thank goodness they’ll be available for VP in Tier 12, because that kind of loot “luck” is enough to make me reconsider being a holy paladin, after all. ODS also did not drop the ring I was hoping for. It’s a minor upgrade (I have one 359 and one 353) but every little bit helps! I’m not entirely sure what I’m going to do with my VP before we go on vacation. Should I go ahead and buy something off-spec (I can’t afford anything main-spec) since I’m already at the JP cap as well? Otherwise those VP are just going to be wasted, so I may endeavour to get them to 700 so I can snag the Retribution relic, probably. No sense in wasting them. I can already begin to see that gearing a retribution off-spec is going to be dead easy. I picked up two OS pieces last night alone, including a chest from Cho’gall and some bracers from ODS. I don’t anticipate having to play it often, but I like to be ready just in case. Finally, in my random list of paladin-raiding things that aren’t much related; I’m probably going to drop engineering after 4.2. (I’ll drop it when a viable helm upgrade presents itself, so probably not immediately). I just can’t see it being that strong a profession for a healer without the cogwheel sockets, and the on-use intellect tinker is okay but it’s not constant (as, say, jewelcrafting would provide). I imagine it evens out to approximately the same thing but I had engineering as an “alt-fun thing” and not as a serious raiding thing. I’ll be sad to say good-bye to my roflcopter, and in-character Vid will always be an engineer, but I can’t really stay engineering just for that purpose. I wish they’d introduce another tier of engineering helms. I suppose other professions as well suffer at the second tier – Alchemists may let go of their trinkets, etc. Honestly? I just really like the goofy goggles. They contribute to the paladin feeling of field medic/triage to me.